Oh, Ophelia, you've been on my mind girl since the holidays. 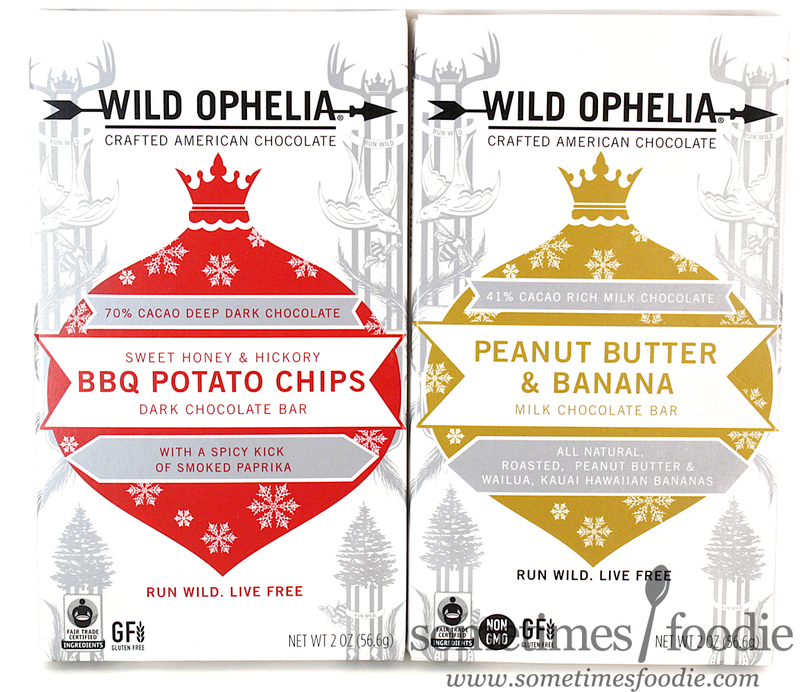 As you can see, the packaging for these two products has a Christmas-y holiday-motif, because they were being marketed as stocking stuffers, but the logo and totem-pole-like images on the side are now part of the permanent design for Wild Ophelia. They've since ditched the cowgirl-feel of their older embossed cardboard packaging and gone with a modern woodsy feel that makes me think of winter style catalogs from hipster stores like Urban Outfitters. 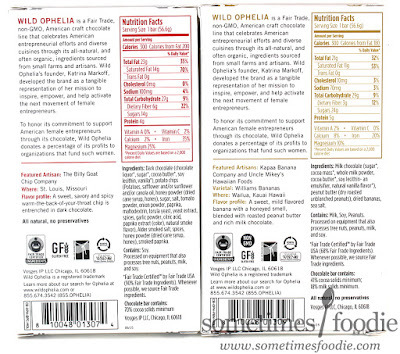 I really like the new simplified logo, and the overall layout, but I do miss the texture of the older packaging. If they could emboss this new logo I'd be a lot happier, but I do like the direction they're headed in with their overall re-branding, and as far as holiday themed candies are concerned, these looks pretty darn classy. Inside each box is a chocolate bar that's been wrapped in silver foiled plastic. The bars are broken up into three large segments with a diagonally striped pattern across the top. 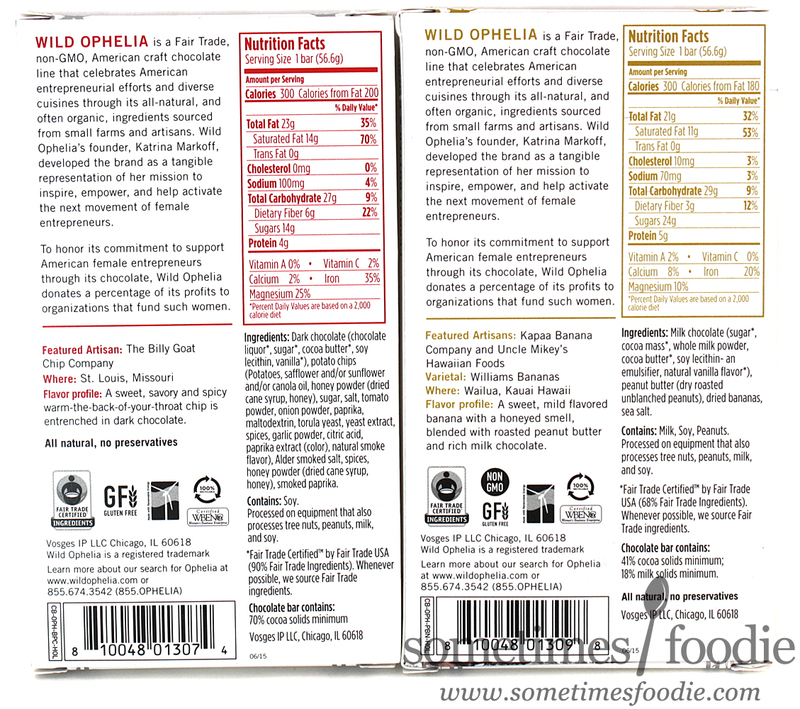 The cardboard packaging may have changed, but the bar itself looks exactly as it did back in 2013. First up, I'm revisiting the chocolate banana bar. I first had this back in 2013 and I really enjoyed it, but my biggest complaint was that there weren't any banana chip chunks or bits to enhance the banana flavoring. Was that still the case? I broke off a shiny segment and took a bite. The chocolate was very light and aerated making it melt right away revealing a delightfully blended chocolate peanut butter flavoring. The bar itself reminds me of Reeses spread, in solid form, which is exactly how I remembered it, but the banana portion seemed amplified this time around. As the chocolate melted I was left with these chewy caramelized banana bits that reminded me of those chewy banana coins from Next Organic. When you first bite into the bar you don't get much of the banana, but when you start chewing on those itty bitty banana bits they start to shine. I did find that they got stuck in my teeth a bit, but I really didn't mind at all. I don't remember the banana portion of this bar being this good in the past, so I'm guessing they've tweaked their recipe a bit to give it a bit more presence, and the end result is way better. I liked the last bar, but I really love this new one. Next up is a new flavor for me, BBQ Potato Chip and dark chocolate. This one smells like a classic dark chocolate bar, which smells bitter like cocoa powder, but there's an added smokiness that reminds me of the Jerky bar I reviewed all those years ago. 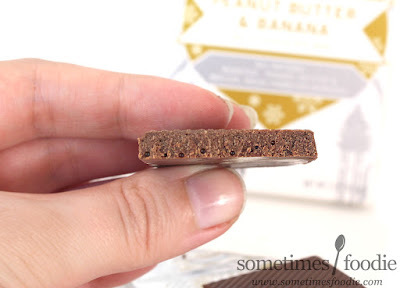 This bar is a bit glossier and less aerated looking than the Peanut Butter one, and when I broke off a segment I could see the little flakes of potato chip mixed into the chocolate. I took a bite, and the flavors need to rest on your tongue a bit before things really get going. 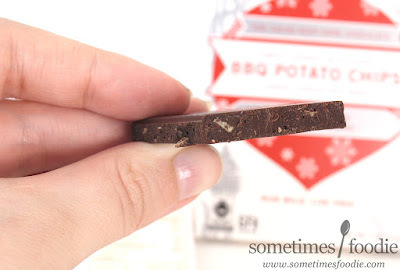 The chocolate isn't as light and fluffy as the other bar, so it takes a longer time to melt, but once it does the bitter sweet chocolate melts away to reveal a smokey paprika flavoring while the chip mix-ins add a nice crunch and hint of savory potato flavoring. The BBQ aspect sounds like it would be a novelty, but it's actually a really enjoyable candy bar. The smokey flavoring with a hint of spice really doesn't shine until the very end, when most of the chocolate has melted away, but that savory finish with a tiny bit of heat is really enjoyable, and very different from other traditional candy bars on the market. Safe to say, this company has only gotten better with age. I'm really happy I revisited this brand because it seems like their packaging and they product have vastly improved over the years and I'm excited to see where it will go in the years to come. 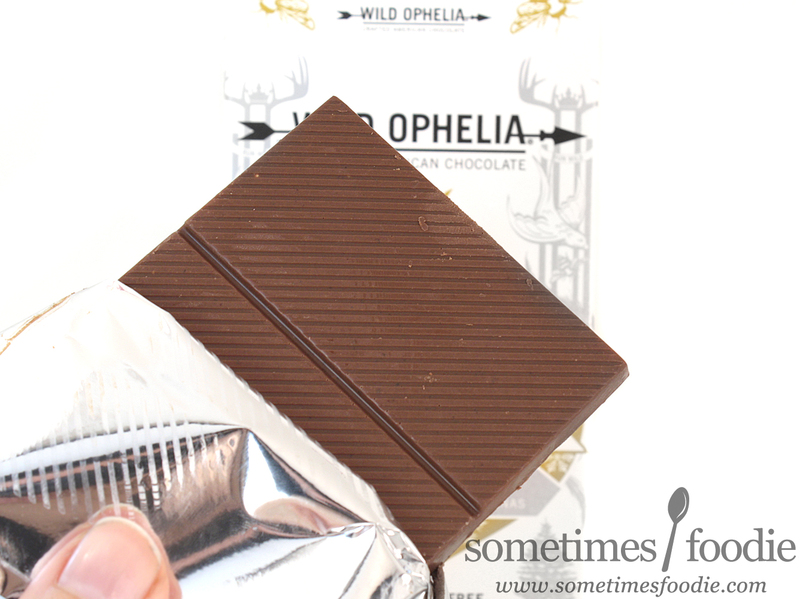 If you're looking for a fancy chocolate bar that actually delivers the fancy flavors it promises, look no further.